HELLOWEEN are one of the most influential and internationally successful acts of the global metal scene. With the release of their 14th studio album due on 1st June, the pumpkin heads are set to further cement their title as the founding fathers of German melodic speed metal. My God-Given Right was recorded between October 2014 and February 2015 at the bands very own MiSueno Studio in Tenerife, with long term producer Charlie Bauerfeind (BLIND GUARDIAN, HAMMERFALL) handling production and recording duties. The enchanting artwork was once again created by graphic guru Martin Häusler (BON JOVI, QUEEN, GOTTHARD) and will also be available as a 3D Lenticular print. Frontman Andi Deris states: ”I never know how, but somehow we did it once again…the albums really rocks and kicks some major asses!!! We had the best folks with us to make this possible. Their most recent studio effort, Straight Out Of Hell saw HELLOWEEN entering the official German album charts on a sensational #4. 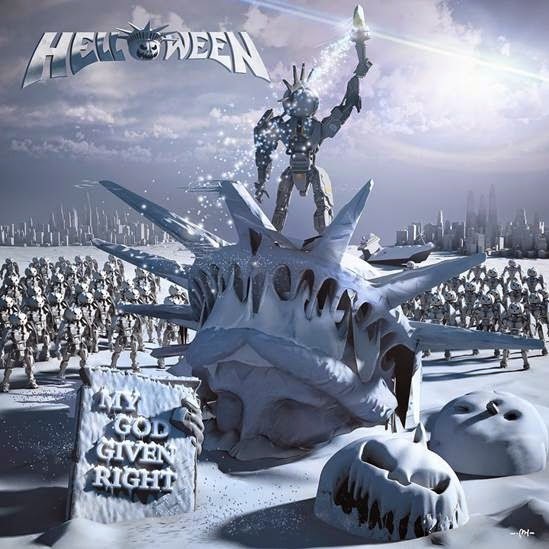 Keeping this high position for five long weeks and charting several other European Top 10 ranking as well as the US Billboard Top 100, Straight Out Of Hell is the most successful HELLOWEEN so far.